WHY SHOULD I CARE ABOUT MY BALANCE? There were 2.5 million emergency room visits for nonfatal falls in the 65 and over age bracket; over 700,000 of these visits resulted in hospitalization. The direct cost of these falls was estimated to be $34 billion. 20-30% of these falls will result in moderate injuries that keep the active aging from being mobile and inhibit physical fitness. From 9 months to 90 years balancing while walking, even though the simple obstacle course of a living room, is vital. Given the statistics above, it is important for the actively aging to increase their balance-ability. In addition, trampoline exercise for seniors is a great way to not only increase balance, but strength and muscle training as well. Stand up straight with your feet a few inches apart. Put your arms over your head palms touching. Lift your right foot a few inches off the floor, balancing on your left leg. Hold this for as long as you can. 5 secs is a good start; aim for 30. Lower your foot to the starting position. Repeat with your left leg. This completes one rep. Looking for a challenge? Try it on a JumpSport Fitness Trampoline! 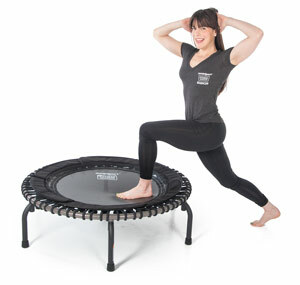 Get on your JumpSport Fitness Trampoline, standing comfortably with your feet a few inches a part. If you have a handle bar, position yourself with the handle bar on your left side. Put your arms straight out, then lift your right leg straightening it out in front of you while slightly bending your left knee. Hold this for as long as you can. 5 secs is a good start; aim for 30. Lower your right foot to the starting position. If you have the handle, turn 180 degrees of the handle is now on your right side. If you can, repeat 5 times. LOOKING FOR MORE BALANCE EXCERCISES FOR SENIORS? 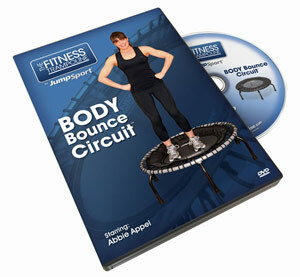 Try Abbie Appel’s Body Bounce Circuit! She focuses on understanding how a rebounder works and exercises that increase strength, muscle development and balance. The video contains a series of balance exercises that would be great from the young at heart! This is the first in our trampoline video workout series and is great for the beginning rebounder or someone looking for a regular workout routine that they can build on.